We are Corey and Jen, and of course our dog, Piggy. We were both working regular jobs in an office. Jen worked for a large construction company as a corporate recruiter. I worked for a local photographer editing photos and doing IT work for some of my long time clients. We had a nice little apartment in Laguna Beach overlooking the ocean. What more could we ask for? We both have always enjoyed the outdoors. 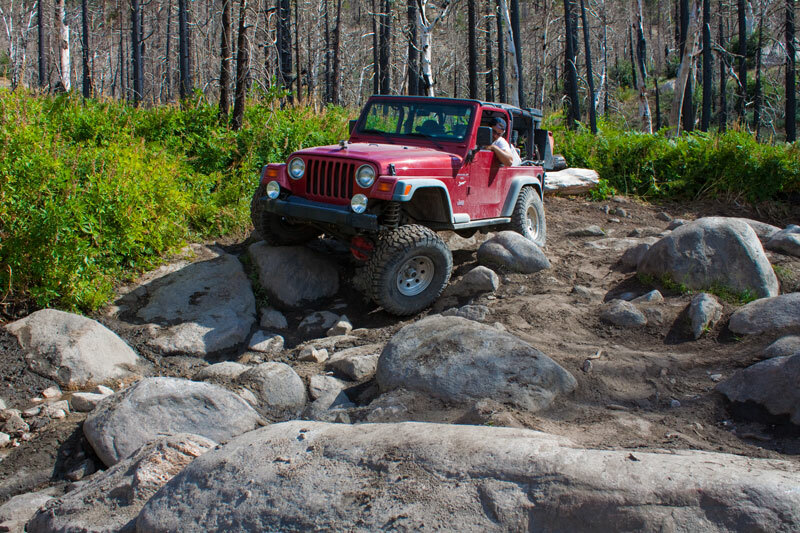 I have been an offroad enthusiast since I was a teen, I spent as much time offroading in the local mountains and deserts as I could. Jen would take camping trips up to the local mountains with friends and family throughout the years. Eventually, we both succumbed to the “adult life”. I gave up my gas guzzling truck for a commuter vehicle. Jen dove into school and work. We got full time jobs, paid bills, and wracked up debt. We did all the things everyone told us we were supposed to do. We became drones. In 2011, I moved to Laguna Beach to enjoy some of the best views and photography opportunities available in Orange County. At this time I really started rethinking the path I would like to take with my life. As it turned out, Jen was also thinking about the same thing. “Then we met again, for the last time” ( A whole story unto it’s own). Jen and I started talking about our love for seeing new places, travelling and how we missed camping and the outdoors. Our first outing/date, was a camping trip to Jalama Beach for the 4th of July weekend. That set the tone for the rest of our future. As fate would have it, my commuter car died and I was left to find new transportation. Then along came my 1998 Jeep Wrangler TJ. H8ROADZ. Great Outdoors here we come! We started off spending weekends exploring the local mountains and deserts in the Jeep. In fact, I bought the Jeep in August and the end of that month we did a 3 day long trip from the Highway 38 through Big Bear all the way to the I-15 using as much dirt roads as we could for Jen’s Birthday. Then we did it again in the opposite direction for my birthday the very next week. The short trips turned into longer road trips to Colorado, Utah and Arizona. 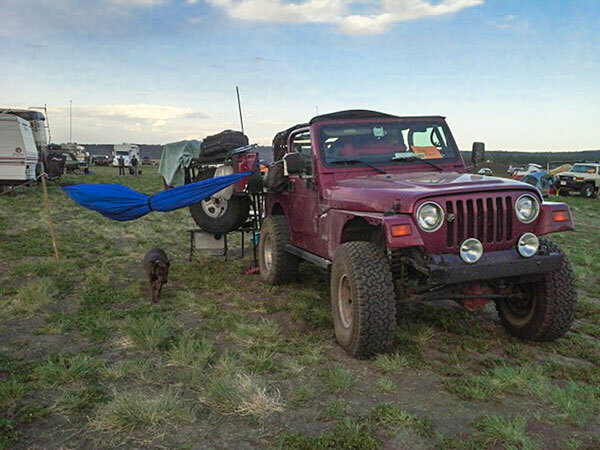 One of these trips we have tried to take each year was the Overland Expo at Mormon Lake, AZ. 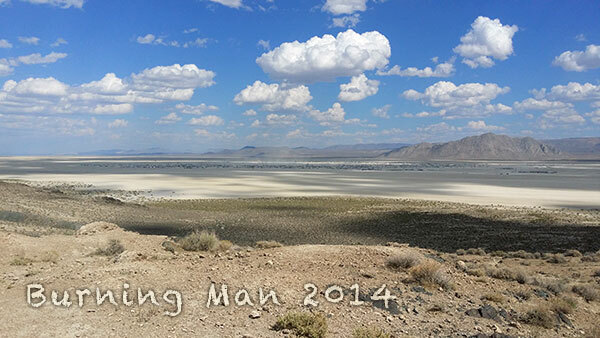 Awesome place to visit for anyone interested in camping, especially if you do it in a vehicle. In 2013, Jen was laid off from work, all that so called job security. We started discussing business options that would allow her to work from home. It turned out to be an easy choice, corporate recruiting, the same thing she was doing in an office for someone else. My work was already something I could do from anywhere so I just needed to figure out the logistics and make the jump. We then started thinking about how we would travel. Since we liked the ability to travel offroad. 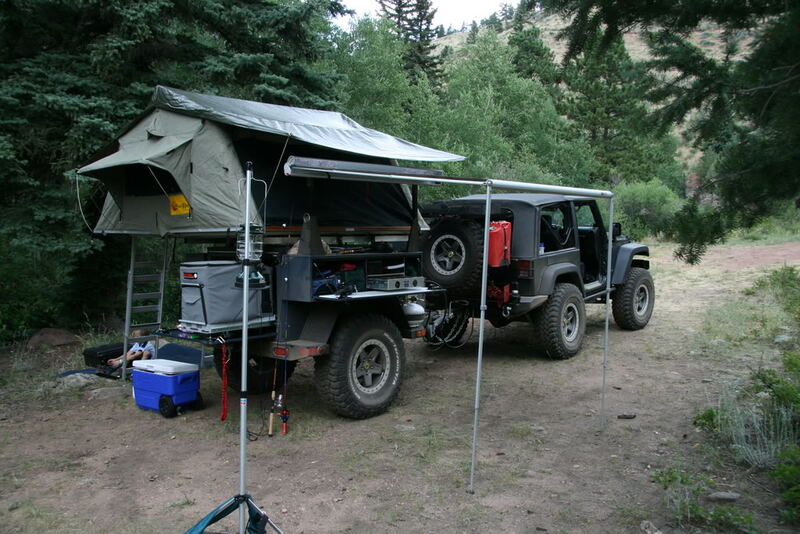 We looked into making an offroad capable teardrop trailer that we could tow behind the jeep. I started planning how I could build it. I even expanded my offsite storage unit to accommodate the build and storage of the trailer. We also talked about the posibility of getting a motorhome. One Day, I was passing a RV Rental/Sales location that a friend had used before and decided that I would stop and look on a whim. 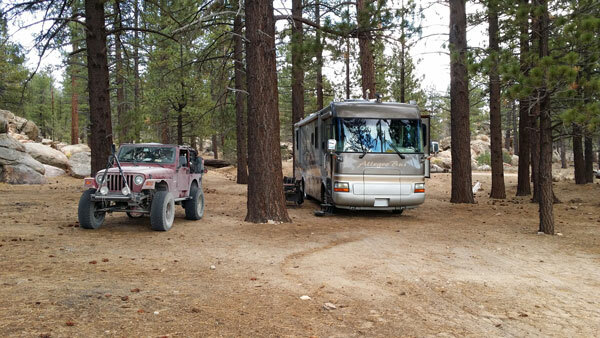 I saw a motorhome that I felt would be the perfect size for us to tow a jeep and give us ample living space. I asked about it with the service manager. He told me that the owner would likely be interested in allowing us to take over payments. Perfect! My mind started running. A few months passed and we were still in the apartment in Laguna. We were forced to move into a lower unit in the back. They were also nice enough to raise our rent in the process. I was getting sick on a daily basis because of something in the air. We were not happy. So I decided to go down and talk to the RV Place again and see if we could work something out. We did. I came home told Jen, guess what… we are moving… into a motorhome. A 2003 Tifin Allegro Bus 32IP. We were thinking of what we were going to name our coach. Our 2 year old granddaughter was the one who finalized it’s name, Harvey, when she saw it the first time and tried to say RV. We moved into Harvey for 56 days. We still had to stay in Orange County while I transitioned my clients to work remotely and to deal with family matters. So we stayed in parks and parking lots right next to where I was working most of the time to minimize my drive. This meant no pop out usage. We learned a lot about local city ordinances during this time. During this 56 days, we learned about some of the issues we would need to get accustomed to like tight quarters, water conservation, power usage, Internet access, and toilet backdraft smells. Technically we were already used to the smaller space, because our apartments were already small (200 sq ft ish) with 2 people, a dog and a cat. (Sadly our cat didn’t make it to the transition to Harvey). We were used to daily morning showers, nay nay said Harvey. Jen would say, power has been the hardest thing to deal with, we have a great generator, but I really dislike running it. I would say, dumping tanks every week is the worst of it. We made a weekly trip to a campground (Caspers Park) or RV park (Lake Park RV Resort and Lodge Passport America discounted) for this purpose alone. Refill and dump, take advantage of power. Internet Access was easy since we were still in a populated area. We got through it. Figured out what worked and didn’t for the most part, came up with some projects to make us more efficent. When we signed the deal for the coach, it was being rented out by the original owner who couldn’t use it anymore. There were a few rentals scheduled already and we told the rental company we would honor them. (I plan to write about this type of arrangement in another article). After the 56 days we gave up Harvey for a month which then turned into almost 2 months of straight rentals. This was not going to be an issue, I thought, because I also own a time share, so we could stay at one of our locations. As it turned out Summer time in Orange County is busy, and getting into the 1 location in Orange County right next to Disneyland is difficult, go figure! Luckily we had family we could stay with. 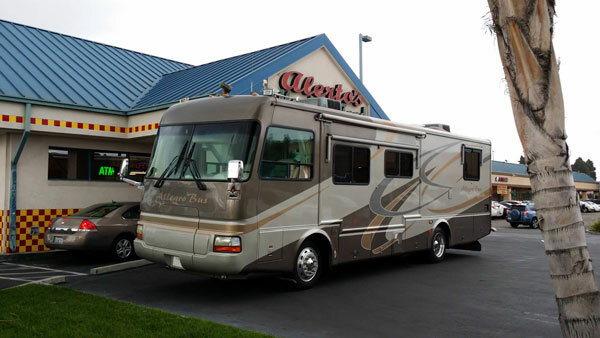 After the long rental period, we had the coach for 18 days before we had to drive it up to Burning Man for another rental, so we took opportunity to take a cruise to Alaska while it was out, then we drove it back to Orange County to have it serviced and cleaned. Obligations fulfilled. Now we are back in Harvey. We are both working remotely. It’s October, still dealing with family transitions, that should be complete by the end of the month. Crossing fingers. We are diligently working on some of the projects we need to complete until then. We have tried to get away more often this month, and have gotten a few short trips under our belts. Things are going in the right direction. We now own our own home. We are Explorers. We have overcome obstacles. We command our own destiny. This is the Real “American Dream”. We hope to see you all on the road or in the dirt soon.